Winter Sick, and Book 4: This Immortal | Oh, Rachael. I’m going to warn you right now, this review is going to be awful. I don’t mean negative–not at all. I mean the review itself is going to be crappy and unhelpful. See, this book shouldn’t have taken me over a week. Not at all. It’s a fast-paced 213 pages. It should have taken me between 2 and 4 sittings. However, I spent about a week coming down with something, plus about two days being actually sick curled up in bed watching Dollhouse marathons on my tablet and trying to move as little as possible so I don’t throw up again. All this adds up to a brain that isn’t working very well. I’m pretty sure there was a day that I fed the cats, crawled into bed, and asked Mike to feed the cats, and he told me that I had just fed the cats, and I absolutely didn’t believe him. That might have been a dream. I don’t even know. I know similar things happened. For example, I also asked my boss about something that she had hung on the wall that I swear I had never seen before, only to find out that she had pointed that out to me a while ago and we’d talked about it for 20 minutes or so. And about halfway through my book, I realized that what the characters were doing didn’t make any sense, at which point I flipped through to the beginning and suddenly understood something awful. See, there are some characters who only really are referred to by their first name, and some who are only referred to by their last name, and the whole time I’d been reading, I’d been equating them. So halfway through, I realize there’s no Phil Myshtigo. There’s Phil, and there’s Myshtigo, and they are not remotely the same person. After I got that cleared up, the book made a lot more sense and I finished the rest of it rather quickly. 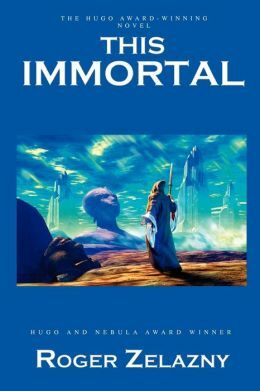 This Immortal straddles the line between Science Fiction and Fantasy, though in general, I would classify it more as SF and recommend it more highly to SF fans. I’m pretty sure I mused a bit in my review of Do Androids Dream of Electric Sheep? about the differences, but reading This Immortal and thinking about how to classify it, I’ve come across something else that I’ve noticed. I find that most amazing fantasy that I read makes me feel, while most science fiction that I read makes me think. It’s an emotional vs. philosophical difference. This isn’t a hard and fast rule, of course–American Gods, for example, is definitely fantasy and definitely a thinking book. Sheesh, I haven’t gotten there yet, okay? The main character, Conrad Nomikos, is a creature out of Greek mythology. He is suspected to be a Kallikanzaros, which I just looked up and is apparently some kind of goblin thing that tries to ruin Christmas, and this is one of those situations where I really don’t think Wikipedia is giving me the whole story because I believe the actual word for that is “Grinch.” He is immortal. His son is Jason, of Greek myth fame, and his wife may or may not be Cassandra, also of Greek myth fame, though that was only kind of hinted at and we don’t really know if she’s immortal. There’s a group of Satyrs, a hellhound, and a giant boar. So, definitely fantasy. The book follows Conrad as he reluctantly gives Cort Myshtigo, a powerful Vegan surveyor and writer, a tour of what’s left of Earth’s landmarks. They’re accompanied by an eclectic group of friends and acquaintances, most of whom I can’t really tell you anything about because my brain wasn’t working well enough for the first half of the book to really have any idea what was going on to talk about them without giving away major spoilers, but the general gist is this: Some of them want Myshtigo dead, and Conrad isn’t sure if he agrees. I definitely enjoyed this book as I was reading it, and I loved the second half once my brain cleared up a little and I figured out what was going on. I definitely need to re-read this, possibly the next time my brain isn’t fully clear to be able to actually understand what’s going on, because two half-understandings might lead to a full understanding. In the meantime, I have a few more Zelazny books that I’ll get around to before too long. Paper Towns by John Green. I’m determined to go into this with a complete lack of expectations. When I read Looking for Alaska, for some reason I expected something fun–I’m blaming his YouTube channel–and got something heartbreaking. After that introduction to his writing, I read An Abundance of Katherines expecting it to be painful, when really, it was quite fun. As you can see, the cover of this claims that it’s “Profoundly moving,” which could mean a lot of things. Posted in Uncategorized and tagged 50 book project, books, fantasy, greek mythology, reading, review, science fiction, SF, sick, zelazny. Bookmark the permalink. I don’t think it was your sick brain. I think this is one confusing book. I just read another review that basically said the same thing. I’m 40 pages in and slogging through this one.